Standardised extract in cranberry concentrate base. Cranberry is most commonly used for the prevention and treatment of urinary tract infections (UTIs). Cranberry is also used for kidney stones, neurogenic bladder (a bladder disease), to deodorize urine in people with difficulty controlling urination, to prevent urine catheters from becoming blocked, and to heal skin around surgical openings in the stomach that are used to eliminate urine. Some people use cranberry to increase urine flow, kill germs, and reduce fever. 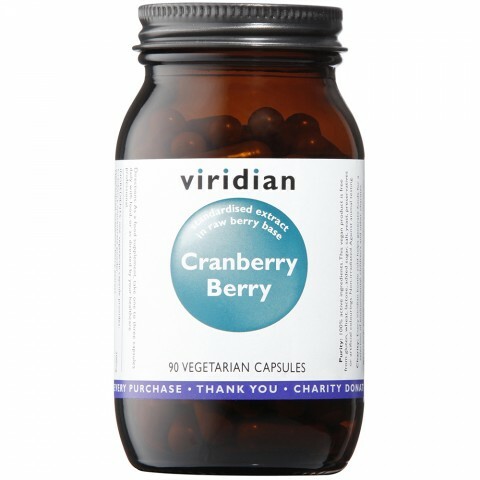 Cranberry concentrate powder 200mg,¾Standardised Cranberry berry extract (30% organic acids) 100mg,¾in a base of alfalfa, spirulina and bilberry.